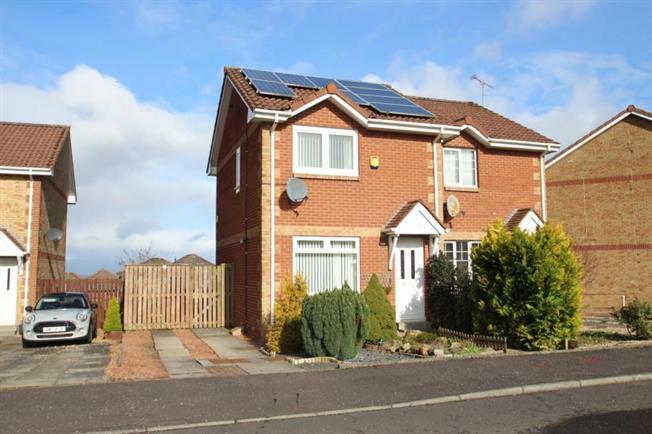 3 Bedroom Semi Detached House For Sale in Falkirk for Offers Over £122,000. This is a great opportunity to purchase an attractive and well proportioned semi detached family home that enjoys a sought after residential pocket within Maddiston. Internally this charming extended home offering accommodation over two levels comprising of a welcoming reception hallway, bright and spacious lounge, a modern fitted dining kitchen complete with a range of base and wall mounted units and complimentary worktops. The kitchen then leads on to the separate sizable utility room. Upstairs there are two double bedrooms, a further single room and a luxury three piece family shower room. There is good storage integrated throughout the layout of the property that is further enhanced by gas central heating, solar panels and double glazing. The property sits amongst attractive gardens with the front with a slabbed driveway to side providing optional parking for numerous vehicles. The open rear gardens features two timber decks along with a timber shed and artificial grass. Early viewing is highly recommended to fully appreciate the level of accommodation on offer this can be arranged by the Selling Agents.